It’s always good to take time out from developing or running a service to look at the full end to end design and consider how it could be improved. Last week we decided to do this for all 8 of our vehicles digital services. 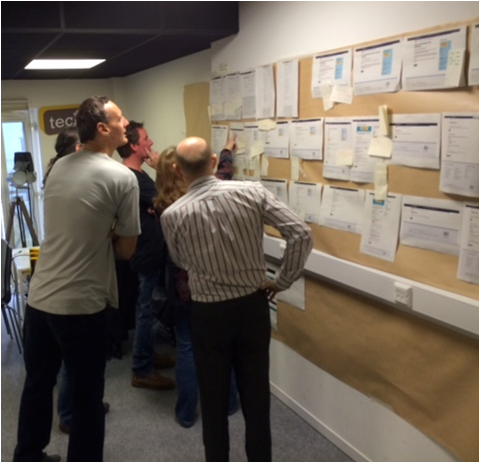 We gathered together - a varied group of experts from across DVLA - content and interaction designers, user insight, technical architects, developers, analysts, operations and delivery managers, testers, as well as contact centre and policy colleagues. I started the day by reflecting, to the group, how excellent our services are and how high our user satisfaction is. I tempered this by saying we should be restless in our ambition to continually improve them. If we leave them as they are they won’t be relevant for long. Are we all using the same language? Is there any duplication? Where can we improve? 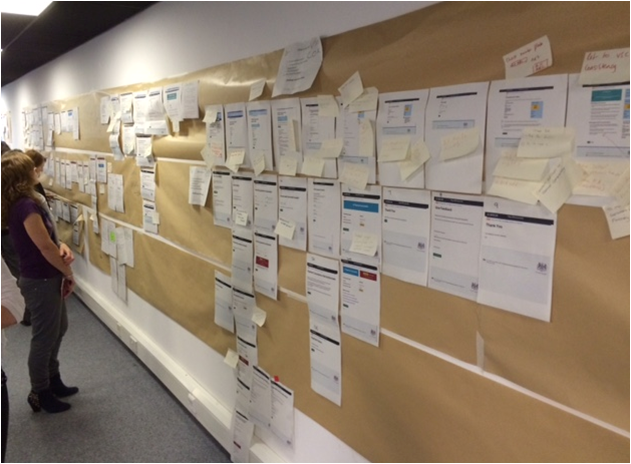 We took copies of each service and the various user journeys and posted these up on the walls. For many it was the first time they’d seen the other vehicle services. Each service team is so busy delivering and improving its own service, we don’t often take time out to review others. Each service has developed, at its own pace, with its own user needs; with the design manual helping achieve a look and feel that is pretty consistent overall. We split into mixed groups and reviewed 2 different services in each session, 4 overall, with time to wander the room to benchmark against others. While each service has its own unique needs, our user base is pretty similar, save for our fleet’s enquiry service, which is solely aimed at commercial customers. We’ve developed different user journeys for different users eg motor traders, and we’ve have tailored our language to fit. We see this as a positive as the user base would have more familiarity with the services. We shouldn’t lose this. There is an opportunity to be more consistent with design. For instance each service has developed its own start and summary page and captured its own image of the V5C registration certificate. Why can’t we develop a summary page once and re use it? Some specific terminology used differs, sometimes rightly so, but there is a need for further insight to see whether this impacts on the user experience. The language could be simplified and made more consistent. When you’re so close to a service you sometimes can’t see the obvious. We shouldn’t change the service without further insight. We need to be consistent but not uniform. Some nuances are there for a reason ie to meet a specific need. As we finished up, there was plenty to ponder – some quick fixes identified, and acknowledgement that more insight was needed for the more substantial changes. I closed by reflecting how fortunate we are to have a wide group of passionate people, all committed to delivering excellent services. Bringing them together more often to share ideas and share best practice is definitely top of that to-do list. Consistancy is very important accross the different platforms. it's good to get someone else's view point as it is very easy to get carried away and miss the obvious. it's very easy to see/read what you want too not not actually see what is in front of you. As a mere private vehicle owner, and at 83 a long-term recipient of various 'Government' services; it is refreshing to discover one which actually looks at itself and what it provides in a critical and analytical way, with the deliberate aim of improving relevance and delivery to the end user, while at the same time making that delivery easier and more efficient for the deliverers. to other government departments which would benefit hugely from such an approach to their operations. It's a great website to use; I've always found it easy to navigate. Keep up the good work. at some Post Offices the post clerk will not give me a tax disc or now will not accept the payment because it does not have MOT, the site will not let me MOT the vehicle by Direct Debit because the DVLA have no details of MOT!!! I have to travel around post offices to find a competent Clerk that can understand a Taxi test certificate, the people that organised this site must be Muppets, I have been taxing this vehicle since new what a pain, will I get an answer regarding this ???? You can only tax online if your vehicle was registered as a taxi or hackney carriage at first registration – you would be able to self declare online (using form V112). Only vehicles that are built specifically for use as a taxi can have the body type recorded as such and the body type cannot be amended in relation to the use of the vehicle. As you know if you are using your vehicle as a taxi (but the body type is show as, for example, a 4 door saloon) and it is being tested and given a certificate of compliance you need to tax at the Post Office®. You have to complete the V112 declaration or provide the local authority certificate of compliance at the counter. I am sorry you have problems taxing at the Post Office®. We will drop a note to the post office contract manager and ask them to put out a reminder about the correct documentation that can be used when a customer is trying to tax a vehicle that is used as a taxi. In the meantime if you wish to make a complaint about the service you receive at the Post Office® you can do so here http://www.postoffice.co.uk/contact-us-complaint. Can the Licence summary include ban dates from/to as Insurers often ask for this info when an individual shows a ban coding rather than points (i.e. the paper counterpart used to show from and length of a ban etc)? If the driver has a ban the length of the ban is shown within our View Driver Licence and Check Driver Licence services. We also display the offence date, sentencing date, conviction date, penalty points and the fine. Is the DVLA digital strategy available to view? The DVLA strategic plan sets out the agency’s direction for the next 3 years.